Why can’t I ever lose weight? Why do I have such a hard time losing weight even though I exercise and eat fewer calories? If these are some of your questions, then this video is for you. 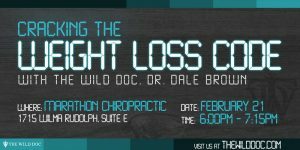 This is not your regular weight loss seminar. Watch as the Wild Doc discusses medications that could be causing you to gain weight, why you shouldn’t eat breakfast, why certain “fad” diets don’t work, secrets to true weight loss and so much more. The Biology of Human Starvation. Two Volumes. Biology’s response to dieting: the impetus for weight regain.